The setting starts out so lovely. You walk into Oracle’s cozy little cabin of a space off of Broadway and you’re greeted with what looks like a charming Tuscan villa. It’s the kind of place that the erstwhile star of a Nancy Meyers movie might retreat to “find herself.” Sure everything’s a bit grayish and decaying and there appear to be giant ragged holes in that patio umbrella but, look, there’s a bowl of fruit! What a charming still life. What could go wrong with such a lovely bowl of fruit? Well, when the play you’re about to see is set during the death rattle of the Roman Empire and you’re in the hands of a pair of men—Gore Vidal and Friedrich Durrenmatt—who don’t exactly traffic beach-read escapism and, really, when it’s an Oracle show in general, the answer turns out to be: pretty much everything. The play is called “Romulus” and it is Vidal’s rather loosey-goosey adaptation of the play “Romulus the Great” by Durrenmatt. The latter was a mid-century Swiss playwright who specialized in withering, absurdist take-downs of capitalism, and the former was one of the great lefty lions of said century’s back half. Needless to say, money and empire and Rome and America and conservative values and patriotism don’t exactly fare well. 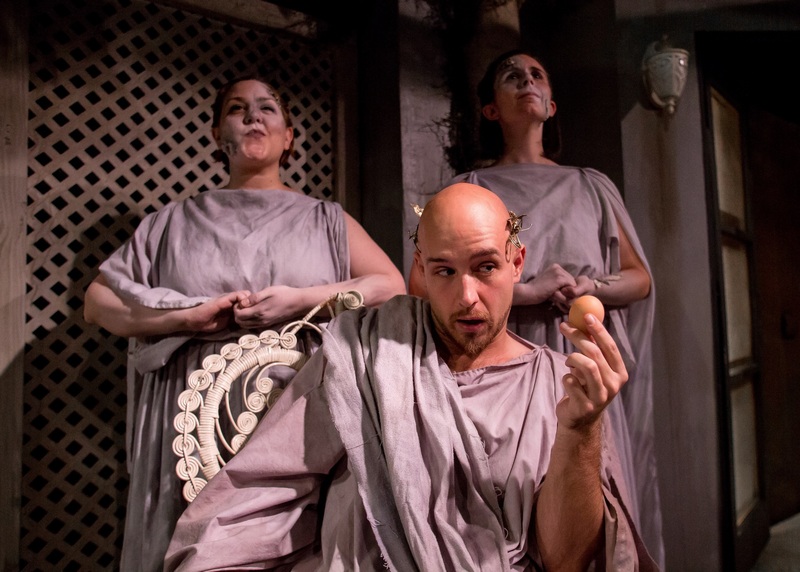 Director Kasey Foster and a spirited cast offer a rousing production that adds a daffiness of its own to Vidal and Durrenmatt’s polemical lunacy. Although the language and the humor is oftentimes quite heady, the story itself is a simple one: the Roman Emperor Romulus (Kevin Cox) has decided that he would rather breed chickens in his villa than do anything to stop the oncoming Gothic hordes led by Ottaker the Butcher (Miguel Nunez). As his wife and courtiers and fellow heads of state plead for him to act, he instead focuses on things like selling off his impressive collection of busts to scheming art dealers. And when the richest man in the world, who made his fortune off some new-fangled invention called “pants,” offers to buy Ottaker off in exchange for Romulus’ daughter’s hand in marriage, he refuses. Soon enough, it is not only the Goths who are looking to do away with the erstwhile emperor. Foster emphasizes the contrast between the affable, apathetic Romulus and the patriotic blowhards who surround him, by painting everyone but Romulus to look like a statue. (Makeup and costumes are by Tara Smith.) The characters move like statues as well, working from set poses and making only strong, declarative movements. The effect is of a single human man beset on all sides by stereotypes. Everyone except for Romulus is so old-fashioned and Classical-with-a-capital-C in their mindset that they have literally turned to stone. He is a man ahead of his time and out of his time: the only one with an understanding that what has passed will no longer be, and what is coming next will be worst. When the Goths finally arrive clad in modern fatigues, it confirms that their march on Rome has been nothing less than the march of time itself. As Romulus, Cox is wonderful. He mixes several different shades of levity and melancholy with a booming gravitas that holds the show together. The rest of the cast are generally tasked with being over-the-top cartoons and most do just fine, but it is Cox’s Romulus on which everything else hangs. Alexis Randolph and Colin Morgan also give fine, nuanced performances: Randolph as Romulus’ gothy (which is different from Gothic) daughter, Rea and Morgan as her war-scarred true love, Aemilian. Oracle Theatre, 3809 North Broadway, publicaccesstheatre.org, Free. Through November 22.